The U.S. Department of Agriculture is proposing to allow the importation of irradiated pineapples and other tropical fruits from Thailand -- products that could compete directly with Hawaii fruits for sales on the mainland and locally. Besides pineapples, the proposal would allow the direct importation of lychees, rambutans, mangos, longans and mangosteens, which are grown in approved areas in Thailand and treated with irradiation to kill insects and other pests. The proposed rule change was published yesterday in the Federal Register to seek public comment on the new rules. Agriculture statistics show an estimated 212,000 tons of pineapples were grown in Hawaii last year with a value of $79.3 million. About half of the crop was sold as fresh pineapples, which command a higher wholesale price than fruit for processing. 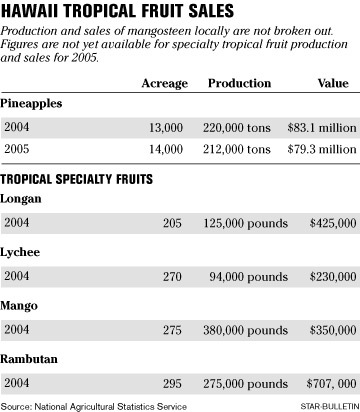 The tropical specialty fruit industry is much smaller -- about $2.1 million in sales during 2004 -- but the industry has been a bright spot in the state's efforts to diversify agriculture. Terri Gorman, director of corporate communications for Maui Land & Pineapple, said the company had not seen the proposed rule change yesterday and could not comment on how it might affect the local pineapple industry. But tropical-fruit growers said they believe it will be difficult to compete with Thailand on price. "Any place in the world can grow it cheaper than we can grow it here," said Leslie Hill, of the Wailea Agricultural Group, which raises and sells lychees, rambutans and other tropical fruit. In Thailand, Hill said, rambutans can sell for 5 cents a pound, versus $3 a pound in Hawaii. "It (the impact of the rule change) could be dramatic. The whole state of Hawaii could be affected. We grow the same things (as Thailand)," said Susan Hamilton, a vice president of Hula Brothers farm and the Hawaii Tropical Fruit Cooperative. The growers say Hawaii can still offer a better-quality product that can command a higher price. "We've been able to compete against fruit coming up from Central America and Mexico," said Richard Johnson, of Onomea Orchards and the president of the Hawaii Tropical Fruit Growers Association. But they say the USDA is favoring other countries over Hawaii. Growers noted that the rule change proposes allowing mangosteens from Thailand to enter the United States with irradiation treatment, but USDA does not allow mangosteens from Hawaii to be shipped to the mainland using that treatment. "The United States Department of Agriculture treats us with less respect, less funding than it does for foreign competitors," Hamilton said. "Are they going to see the same kind of inspections and governance that we do? Historically that doesn't necessarily hold true." Lyle Wong, plant division administrator of the state Department of Agriculture, said the growers have a point, and the state has formally asked the USDA to allow mangosteens from Hawaii to be shipped to the mainland if the rule change for Thailand is approved. In yesterday's filing the USDA said it is unlikely that the importation of fruit from Thailand will "substantially affect" local markets for pineapples and tropical fruit and that the rule change could benefit U.S. businesses that import fruit. The USDA notes that imports of mangos and pineapples already far exceed the domestic production, and domestic production has remained relatively constant. The agency believes allowing the Thai fruit into the United States will have more of an impact on other countries that export tropical fruit than on domestic growers. But Hamilton said about 85 percent of her business involves shipping fruit to the mainland, mostly to Asian markets, and Thailand will likely be a direct competitor. The fruit growers are unlikely to sue the USDA to stop the rule change should it be adopted, Johnson said. That is because some Hawaii growers use a similar irradiation process to kill pests before shipping fruit to the mainland. In fact, the same process that makes it possible for Hawaii growers to ship fruit to the mainland is helping to create a global market for irradiated fruit, Wong said. He added that the Philippines has asked for permission to ship irradiated mangos to the United States, and other countries are also seeking exceptions. "It's the beginning for more worldwide movement of tropical fruit products using irradiation," Wong said. Tish Uyehara, the director of marketing for Armstrong Produce in Honolulu, said her company prefers to buy from local growers. But she added that local growers have to be competitive with quality, volume and price of their fruits. "We are truly becoming a global market. I think everyone in the food business has to recognize that," Uyehara said.